Razer Panthera Arcade Fighting Stick Review: It's Over 9000! Kamehameha! Greg Burke reviews the latest and greatest Dragon Ball FighterZ arcade fight stick from Razer. Razer has officially added two special arcade sticks to their already impressive lineup of gaming hardware. The Razer Panthera, and the Razer Atrox. These aren’t just any standard Razer arcade sticks as these are officially licensed Dragon Ball FighterZ sticks. The game is currently out on Xbox One, PS4, and PC. Dragon Ball FighterZ will be coming to Nintendo Switch later this year. Please take a look at this review of the Razer Panthera arcade stick. From a pure visual standpoint the Dragon Ball FighterZ fighting stick by Razer looks absolutely gorgeous. 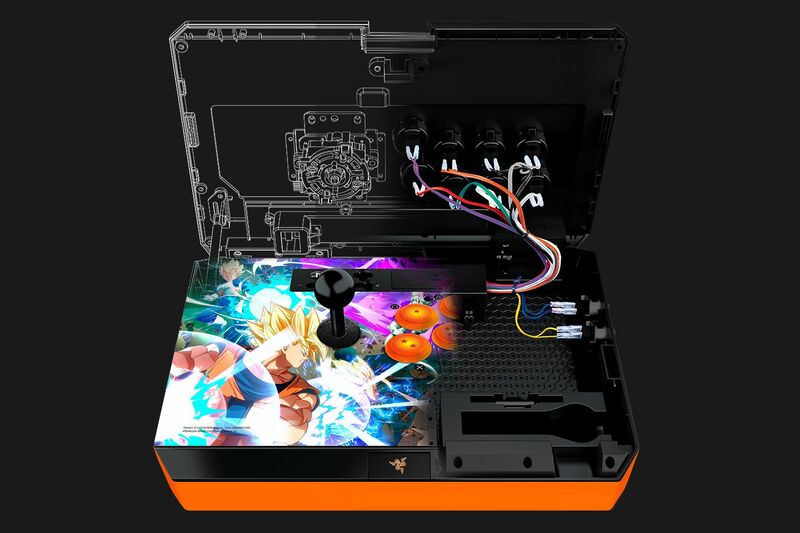 Among its orange and black finish, the top of the arcade stick has key art from the game itself. The buttons are from Sanwa Denshi, and the hardware features ten of them. Eight buttons are a “Dragon Ball” orange and two are glossy black, and several of the top buttons are numbered individually in the form of all seven Dragon Balls. The stick also features an authentic Sanwa Joystick with a ball top. The Razer Panthera arcade stick is also very hefty, weighing in at seven and half pounds (7.56 lbs to be exact). The whole thing looks and feels beautiful but there’s even more depth to the controller. The Dragon Ball FighterZ stick features a one touch button that unlocks the internal storage and innards of the fighting stick itself. Inside your can store the cables, an extra joystick or store the one it comes with for easy travel. That’s not all as the stick is totally mod friendly. In fact, Razer has built this entire arcade stick with modders in mind. With such easy access you’re able to swap out parts and accessories so you can use the exact buttons, or joystick you want. The honey comb structure of the arcade stick is placed inside the bottom of the controller, which can make mounting very accessible. It’s worth mentioning that both The Panthera which is the PS3/PS4 arcade stick and the Atrox which was built for Xbox One vary slightly due to console hardware requirements, The key art is placed differently on the Xbox version, and the weight is slightly differs as well. However, both sticks will work on PC and feature the same buttons and joystick configuration. Arcade sticks can be really overwhelming to get into. Buttons, joysticks, weight, and themes all come into play. If you’re looking for an excellent designed stick that allows you to use it right of the box and update it to your custom taste in buttons or joysticks in the future, the Razer Panthera is a great piece of the hardware. If you’re a fan of Dragon Ball Z it pretty much goes without saying this is the arcade stick for you. This review is based on a review unit provided by Razer. The Razer Panthera Dragon Ball FighterZ arcade stick retails for $219.99 and will be available soon. Greg Burke posted a new article, Razer Panthera Arcade Fighting Stick Review: It's Over 9000!